PVDF Cartridges are made of polyvinylidene Fluoride, PVDF are characterized by High protein binding, low extractable levels, wide chemical compatibility, and high chemical inertness. They are certified bio safe, non pyrogenic & fully validated to pharmaceutical standard. PVDF and polypropylene the unique two materials used in cartridge manufacturing are chemically inert not shedding and biologically safe according to FDA, USP and EEC requirements for pharmaceutical and food contact use. PVDF Cartridge Membrane is used In filtering the highly corrosive Solutions such as strong such as strong acids, bases solution and solvents. The membrane has about 80 – 95 % porosity & uniform pore size distribution. Moreover, the filtration area of each cartridge is as high as 0.7 ㎡. Therefore it offers High flow rate, Low pressure drop & Long service life. These can be steam sterilize direct or reverse as per standard operating data. The membrane stack consists of reinforced-type PVDF filter membrane and imported deflector layer, and possesses superior properties of heat- resistance and chemical-resistance. Hydrophobic membrane with small adsorption. Possessing better performance of oxidation resistance and heat-resistance and wide application Experiencing 100% integrity test before ex-factory . 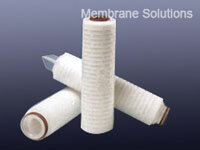 Each Electronic Grade filter cartridge has been washed by ultra pure water.